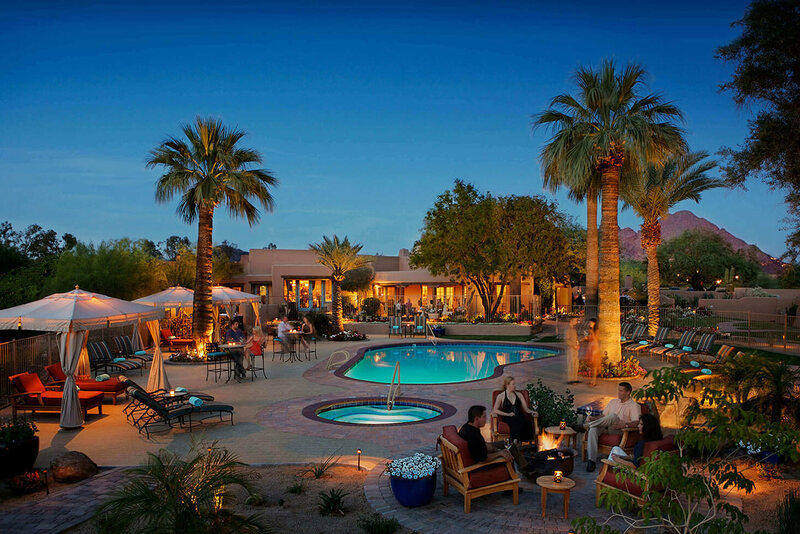 Nestled in the heart of Paradise Valley, Arizona—an exclusive Phoenix enclave that’s just minutes from bustling Scottsdale—lies a AAA Four Diamond boutique hideaway called Hermosa Inn. Originally the residence and studio of iconic cowboy artist Alonzo “Lon” Megargee, this one-of-a-kind boutique resort is the quintessential blend of modern luxury and authentic southwestern charm. Here you’ll revel in world-class amenities amid a peaceful desert ambiance that’s punctuated by striking panoramic views of the neighboring Camelback Mountain. With just forty-three casitas, The Hermosa Inn is ostensibly the most intimate of the region’s luxury resorts, which translates to highly personalized service that’s genuine and familial in feel. Having completed a $5.5 million renovation earlier this year, The Hermosa Inn unveiled ten new deluxe suite casitas and twelve completely renovated historic old-style rancho casitas. Each is designed to accommodate every type of guest, from hardened business travelers to honeymooners. With cozy in-room beehive fireplaces, open-air patios, a lively bar and communal seating areas, on-site painting classes, free-use beach cruisers, seasonal poolside yoga, hot tub facilities, a business suite, and dining to-die-for, The Hermosa Inn is an ideal locale for small group getaways, from weddings, intimate family vacations, and bachelorette weekends to golf outings, board meetings, and executive retreats. Perhaps the most notable of The Hermosa Inn’s amenities is the AAA Four-Diamond LON’s restaurant. The newly-expanded eatery features an authentic farm-to-table tasting menu, complete with top-rated signature cocktails and an awe-inspiring subterranean wine cellar. Lauded as one of the valley’s very best, the outdoor garden patio area is amply sized and replete with wood burning fireplaces, plush couches, and gorgeous fauna and flora that all surround a large trickling water fountain as the focal point. It’s truly the perfect gathering place for any occasion, as is the adjacent LON’s Last Drop bar—a cowboy-chic “watering hole” that’s part of the indoor section of the award-winning restaurant. Interestingly, this bar was named after Megargee’s most famous painting: “Last Drop From His Stetson,” which was commissioned by the Stetson Hat Company in the 1920’s, and to this day still appears on the inside of every top-of-the-line Stetson hat. Understandably, art abounds at The Hermosa Inn. Many original pieces of Megargee’s artwork are on display in the lobby as well as the restaurant. Additionally, copies of many of his works are in the guestrooms as well. Rich in history and culture and oriented toward luxury-level guest service, The Hermosa Inn is the antidote to the assembly line of bland chain hotels or even “one size fits all” resort properties where quantity trumps quality. The property also boasts many events that promote fun and frivolity among guest, who are given various ways to commiserate while they vacay. For example, they have a vibrant arts and culinary program of events throughout the year, and also offer painting instruction with a pro, wine dinners, artist demonstration brunches, cooking classes, and more. These are among the many reasons the property was recently named a Condé Nast Traveler Readers’ Choice Awards winner as the #1 Hotel in the West/Southwest and the #9 Hotel in the U.S. An amazing accomplishment by any measure. But ultimately, at the heart of The Hermosa Inn is authenticity. Although the resort offers modern amenities like WiFi, high-definition TVs, and a refrigerator and Keurig in every suite, this cactus and flower-filled hacienda is overflowing with old-world charm. “We have not turned to technology to replace human interaction,” said Volkers. “In fact, we don’t even use electronic key cards: we still issue real keys at check-in.” I can attest that there is a decidedly residential feel to the property. It feels like a neighborhood. In fact, the property is duly tucked away in an actual suburban neighborhood that does promote a more relaxed sensibility than the more conspicuous resorts.